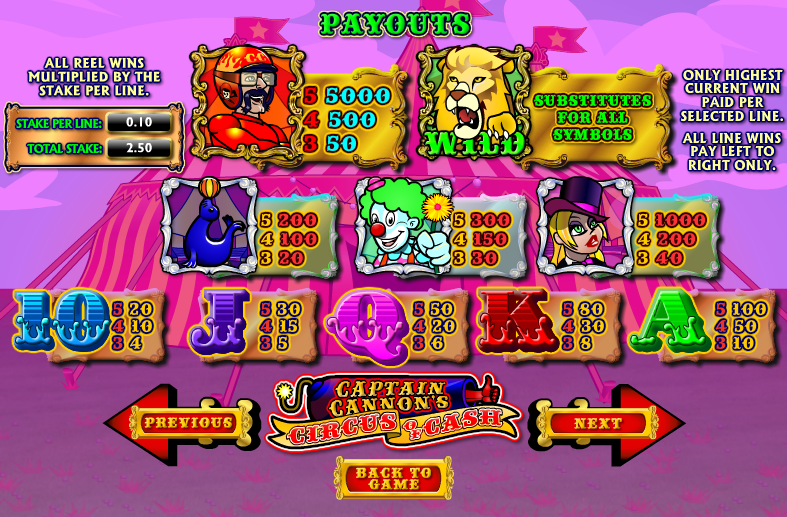 If you enjoy the thrill of a visit to the circus then Captain Cannon’s Circus Of Slots could be right up your street. There’s quite possibly a record breaking number of of bonus features in this game and each of them corresponds to traditional circus entertainment. Playtech/Ash Gaming are the company behind this online slot and it’s a simple and bright offering that offers the player a wide variety of bonus options. In keeping with the circus theme all the standard playing card symbols are decorated in a flamboyant, circusy way and the higher value symbols are the lion tamer, the clown, the performing seal and Captain Cannon himself. The lion is the wild symbol. Fire Breather – This chap will wander underneath the reels and convert between one and three reels completely to wilds. Lion Tamer – The foxy lion tamer will crack her whip and turn up to five symbols on the reels into wilds. Rampaging Elephant – This pachyderm will charge through the reels, knocking some symbols out of the way and replacing them with others – the new ones will be a guaranteed win. Shave The Bearded Lady – Two bearded ladies will appear on the screen and your task is to pick one to shave and hope that you’ve picked the most beautiful one. Even if you pick the wrong one you’ll still win a cash prize. Strongman Contest – You are presented with three strongmen and must pick the win you think is the most powerful. He will then lift the weight and as he does so, cash will count up. Knife Thrower – You are shown a screen with twenty balloons and a pretty assistant and you must fling knives at the balloons to win money or additional throws; you start with five by default. Clown Car Free Spins – A little gold car arrives on the screen and a random number of clowns emerge from it, each worth a certain number of free spins or an additional multiplier. When no more clowns appear from the car the free spins round begins. Tightrope MotorBear – Your task is to set a bear off on a motorbike ride along a tightrope; the further he rides the more more money he will collect. If he reaches the far side he will pick up a clown and come back again – this time the clown can reach up and grab more cash. Captain Cannon’s Wild Ride – This is the biggest prize and all you need to do is fire our hero out of a cannon and watch as he picks up prizes on the way. Some things will speed him up while others will slow him down but he always lands safely in a barrel of water. 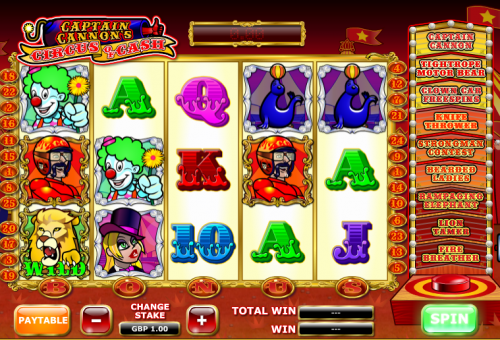 It’s obviously the bonus games which make this slot so entertaining and it should keep you coming back for more circus-related fun. There are five reels and twenty five fixed paylines so the minimum stake is £0.25 all the way up to £250.00.